Increased perceived effort (you “feel” like your workout is difficult). Difficulty with mental focus, concentration and balance. What factors influence how much fluid you need for exercise? Individual differences in how much you sweat. The type of sport, duration, and intensity (the longer or more intense the exercise, the more you will sweat). Temperature of your environment (the hotter and more humid, the more you will sweat). Females generally have lower sweat rates than males. How much should I drink during exercise? Exercise dulls thirst sensation. If you feel thirsty you are already dehydrated. It is best to drink on a schedule. Research shows that if you are running or exercising at a high intensity, you may lose 0.4-1.8 litres of sweat per hour. As a general guideline try one or two cups (250-500ml) for each 30 minutes of training you do. One way to check if you are hydrated is to weigh yourself before and after a workout and see if your body weight has changed. If it has gone down, it is likely a sign you need to drink higher amounts in your future workouts. You need to drink 1.5 litres if you have lost one kilogram of weight. 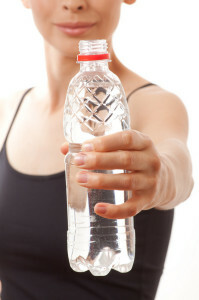 Should I drink a sports drink or water? If you are exercising less than one hour in length, water is all you need. If you will be doing continuous, high intensity exercise longer than ninety minutes, or doing exercise throughout the day especially in hot temperatures, a sports drink or an alternative source of carbohydrate is needed to keep your muscles fuelled with energy. Is coconut water a good choice? Coconut water is extracted from young green coconuts and is very different from coconut milk which is extracted from mature coconuts. Coconut water contains fiber, potassium, magnesium, vitamin C, sodium and carbohydrates. Coconut water is marketed as a sports drink because 1 cup has approximately 46 calories, 9g of carbohydrate and 250 mg sodium (sports drinks have approximately 50 calories, 15g of carbohydrate and 110 mg of sodium). Endurance athletes may be getting their electrolytes drinking coconut water but may fall short in carbohydrates if they are falsely trading coconut water and sports drinks cup for cup since it is slightly lower.